4mm 32G = ideal size for children! Insulin injections are an integral part of the everyday life for people living with diabetes undergoing treatment to control their blood sugar levels. It is therefore essential for them to have the opportunity to select needles well-adapted to their morphology and that are compatible with the pen they are using. 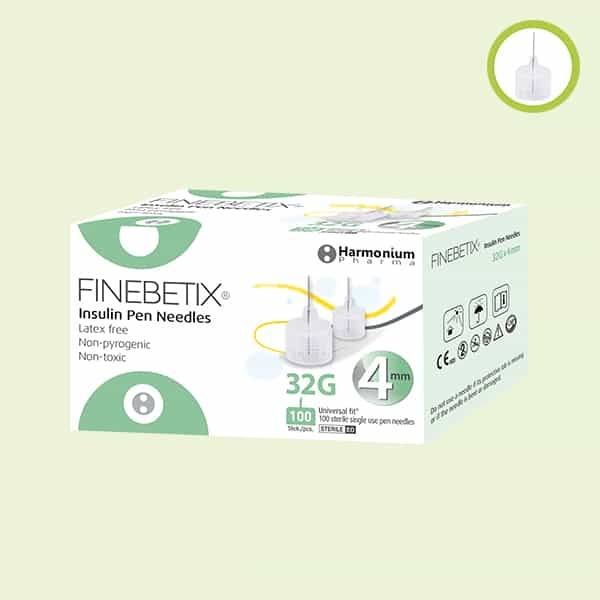 Finebetix insulin pen needles are suitable for the majority of insulin pens available on the market. Their small diameters, 0.25mm for 31G and 0.23 for 32G, ensure a painless and comfortable injection. The length of needle, from 4mm to 8mm, allows its use even for children. Comparison between shorter straight and thinner microtapered insulin injection needles. – Nagai Y1, Ohshige T, Arai K, Kobayashi H, Sada Y, Ohmori S, Furukawa K, Kato H, Kawata T, Ohta A, Tanaka Y., Diabetes Technol Ther. 2013 Jul;15(7):550-5. Improving patient acceptance of insulin therapy by improving needle design. – Norman JJ1, Prausnitz MR. J Diabetes Sci Technol. 2012 Mar 1;6(2):336-8. Needle anxiety in children with type 1 diabetes and their mothers. – Howe CJ1, Ratcliffe SJ, Tuttle A, Dougherty S, Lipman TH. MCN Am J Matern Child Nurs. 2011 Jan-Feb;36(1):25-31. Children with diabetes: the impact of fear of needles. – Rzeszut JR. J Pediatr Nurs. 2011 Dec;26(6):589-92.